Burt Reynolds stars in Sergio Corbucci's impressive early Spaghetti Western with a powerful Ennio Morricone score. Optimum UK R2 DVD. 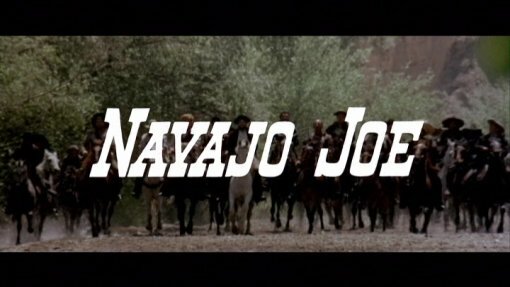 Shortly before beginning work on the iconic Django (1966), Sergio Corbucci helmed Navajo Joe. The Spaghetti Westerns were slowly marking their independence but the script still shows its roots, in this case not so much in the American films but the German Karl May series. Similarly to Navajo Joe, this short running but incredibly popular series had used a Native American as the hero and shown them as peaceful people, forced into violence by the actions of Yankee gangs rather than being violent of their own nature. However the Italian roots and hints of Sergio Corbucci's future projects come in the script's incredibly ruthless atmosphere - although Karl May's bandits are bad, these bandits are genuinely evil, content to kill women and even children without a second thought in their persuit of gold and indeed at the start are prepared to kill for little more than a couple of dollars. Joe doesn't really need much characterisation, he is your typical man out for revenge, unfortunately he does lose a lot of his mystique in the first almost banal conversation with the showgirls, that makes you wish he were more the strong silent type - fortunately his dialogue gets a little better later on but it is certainly not as well crafted as that of Django. Duncan is rather more developed and the script is careful to avoid making him into a mere comic book villain, unfortunately the contrast between him and his obviously more conscientious brother is not explored as much as it could have been. The banjo playing saloon man gives a few chances to lighthearted comedy that the script chooses to downplay as much as possible, helping to retain its downbeat atmosphere. Behind the director's chair, Corbucci doesn't seem quite as confident as he would a few months later - some of the editing is a little snappy and despite the script, the film still has a traditional Western look, more like Hellbenders (1967) rather than the all out unconventional and grim tones of Django and his later Great Silence (1969) - but he certainly provides a good show. The fight scenes in particular (Joe prefers the knife to the gun) have an incredible intensity, with the camera moving in with the action and even rolling over dead, that was rarely matched in the genre. The Spanish locations all look very good, with a nice town set and steam train providing much of the background. Ennio Morricone is credited as Leo Nichols, but he deserves all the credit he can get for the film's unique score, blending Native themes with traditional Western to make one of the genre's very best soundtracks. Before the idea of Italian Westerns was completely settled in the minds of the public, it was common to cast an American actor in the leading role to give the whole production an American feeling. Burt Reynolds is the American this time, at the time an occasional television actor with only a couple of minor films to his credit. Slightly darkened up to pay the role (but really never looking anything like a real Navajo) he looks very good in the action scenes but never quite convinces in the dialogue - although he is not particularly helped by the rather stilted dubbing in the English language version. As usual, Aldo Sambrell makes a very good villain while hard working Fernando Rey looks good as a priest. Not the most original or well written script and with a rather oddly cast leading role, a very strong directoral turn by Sergio Corbucci and an amazing Ennio Morricone soundtrack really save this film and make it a recommended although not compulsory viewing for Spaghetti Western fans, it is certainly of interest to Corbucci fans. Good soundtrack? A amazing Ennio Morricone score - like most of his early work, it was written under a pseudonym. Certainly one for Spaghetti Western and Sergio Corbucci fans to track down. Picture quality is generally strong with only light damage and a little grain. Audio English mono - sounds fine and the music comes through very well. Other regions? Available on an almost identical US R1 disc from MGM (although that print is fully uncut). A Japanese R2 release contained a non-anamorphic transfer. Expected from Koch Media in Germany later in 2008. Cuts? This DVD is cut. 6 seconds of footage are removed from two paces to remove scenes of cockfighting and a dangerous looking horsefall. The latter adds a noticable jolt in the middle of a riding sequence. English language print. Hardly the most original storyline but the script is otherwise sound and the film looks great. Recommended to genre fans. A decent looking and sounding print, but let down by the BBFC cuts - the US DVD has the same print and is fully uncut. Find reviews of other films directed by Sergio Cobucci or scored by Ennio Morricone. All text in this review written by Timothy Young - 19th August 2008.